As we mentioned Monday, yesterday marked the unveiling of the Green 2015 action plan. The Academy of Natural Sciences held a special edition of their Urban Sustainability Forum to introduce the report, written by PennPraxis for Philadelphia Parks and Recreation. 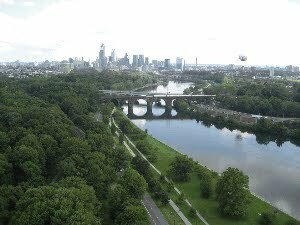 The focus is on helping the city meet its Greenworks Philadelphia goal of creating 500 new acres of green space by 2015. If you were unable to make the event last night, PlanPhilly has graciously posted video footage of the evening's happenings. You can also read the Green2015 report for yourself here.